A DIY rabbit tractor is win-win for you AND your bunnies – we’ve found it lowers our feed bill and the rabbits are happy because they get to eat fresh grass. Which is healthier for them, anyway, right? If you’ve never built a DIY rabbit tractor (this also doubles as a chicken tractor for baby chicks), it’s easy, especially if you’re handy (I’m not, so that tells you it MUST be easy). In this article, I’m going to show you how we built a DIY rabbit tractor for just $50, using both new and repurposed materials. It makes raising rabbits easier with a LOT less work, and your buns will be happier because who doesn’t love fresh grass? With your own DIY rabbit tractor, you can build it, move it around your property, get your lawn (somewhat) mowed, feed your bunnies for less, and give them a happier quality of life. Think of your rabbit tractor in 3 sections – a floor (more on this in a minute), walls, and a roof. That’s all you need (you can add wheels if you want to, but we didn’t with ours). So, you will need to find materials that can satisfy those requirements. We used a repurposed dog pen as the “floor”, a purchased dog pen for the walls, and tarps for the roof. You can use whatever materials you have on hand, or that you feel comfortable using. You can use anything – we found a dog pen like this one on sale for $50, and it fit our size requirements and our budget perfectly. It was built for a small terrier, and it easily fits 3-4 medium-sized rabbits nicely. 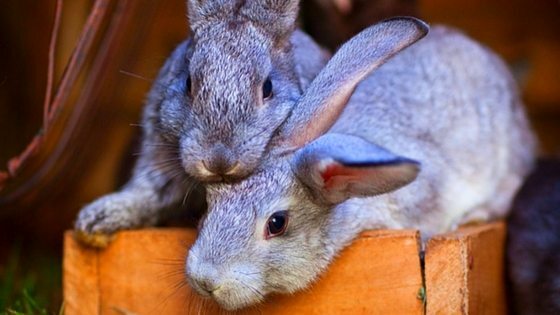 Our rabbits are mixed breed and relatively small, but if you’re raising large breed rabbits, you might only be able to fit 1-3 rabbits in it. Something else to consider is cross-breezes. Since we live in a hot, humid environment, and rabbits, let’s face it, wear fur coats, that means they get pretty hot, pretty quickly. Cross-breezes help them stay cool and prevent overheating. So, a second reason we opted for a dog pen is that the grate allowed for a steady flow of air. Thirdly, it happened to be light – which meant we could move it easily without huffing and puffing or needing wheels. Fourth, well, rabbits CAN have tussles, and are good at knocking things over. This particular dog pen came with metal pins that allowed us to tack the pen to the ground – so it won’t fall over when a rabbit got rowdy AND it keeps predators from knocking over the pen to get a free meal. The pins can be pulled up and replaced when we want to move the DIY tractor. The pen is octagonal – yours can be square, rectangle, whatever. As long as there’s enough room for the amount of rabbits it will hold (the rule of thumb is 4x the length of the rabbit’s body). The walls can be as tall as necessary – in summer, taller means better air circulation. Ours are 3.5 – 4 feet high – a rabbit can’t jump out, but we can bend over easily to feed and give attention. The dog pen also came with a door – a nice feature in case we ever need to get in there if a rabbit is injured or needs to be removed for any reason. When building your own DIY rabbit tractor, include a door for the same reason. Yes, your DIY rabbit tractor needs a floor. Rabbits dig, and they will dig out, sooner or later. So, some sort of grating or wire on the bottom is necessary so they can eat grass but not dig out. We used an old dog pen we had laying around. It has 2-inch holes – big enough for juicy grass to come through and to give rabbit paws a break (if on hardwire cloth or other wire for long periods, a rabbit can develop sores on their feet). You can use hardware cloth, chicken wire, or whatever you happen to have laying around, as long as it won’t hurt their feet or let them dig out, and lets the grass come through so they can eat it. For the roof, since we wanted to build a lightweight, easily movable tractor. Tarps like this one can easily be removed, and are lightweight. To keep them in one place on windy days, we use bricks to pin them to the ground – again, easily removed and replaced so we can move the tractor around. In summer, they provide great shade, and can be moved around as needed to keep everyone cool. In winter, they can insulate against wind and cold and unpleasant weather. If you have a lot of predators in your area (bears, big dogs, a very determined hawk), tarps probably won’t cut it – in that case, you might want to consider grating at the top as well, or a more solid, permanent roof. Either way, your roof needs to provide protection from the elements and shade. If you don’t want your rabbits to live in a co-ed colony, you will want to keep your rabbit genders separate. As of the time I’m writing this, we only keep males in a tractor. Life is complicated enough without unplanned rabbit pregnancies. Does and bucks are weird when it comes to kits, and every rabbit breeder has tales of dead or maimed kits from a jealous doe or buck. Even without the added drama of kits, does in particular are tricky when it comes to space. They’re more territorial than bucks, and can either need more space, less space, or just hate their tractor mate for reasons unknown. Just like teen girls, life gets simpler when does have their own space. However, your mileage may vary. If you plan to keep young bunnies (under 20 weeks old) in your DIY rabbit tractor, then you need to make sure you use 1/2-inch or 1-inch hardware cloth on the lower half. Young does and bucks can fit through very small spaces – the 2-inch by 1-inch holes in the dog crate we used were way too big, and the kits figured out in 5 minutes they could get out. Hardware cloth would resolve this easily. Have you ever built a DIY rabbit tractor? What does yours look like? Leave a comment below!